As the annual turnover of professional manpower trained through the regular institutions could hardly meet the demand of trained manpower in the area of special education and rehabilitation, the council envisaged its vision to render services to all people with disabilities in the country and providing them age and disability appropriate continuum of rehabilitation services, opted for the other mode of curriculum transaction, i.e., distance mode. The Outreach Division has been started in the Council to monitor the distance education programmes, inter-ministerial/ departmental coordination, application of emerging technologies, project evaluation and assessment and resource generation. The distance education programmes initially launched by the council in 2000-01 in collaboration with the Madhya Pradesh Bhoj (Open) University have made tremendous impact on the human resource development in the area of special education. Therefore the council had signed MOUs with a number of other open universities to offer distance education courses, especially in regional languages. The Distance Education Cell continued to monitor the Distance Education Programmes. In order to transform the way the persons with disabilities are being educated, the Council launched a joint venture with Indian Space Research Organization (ISRO) and Medial Lab Asia (MLA), viz., “EDUSAT” up linking station and TV studio located in the RCI building to connect more than 500 Study Centers /recognized institutions via satellite to disseminate information for improving the quality of training in the field of disability rehabilitation and special education in the country. The Studio was inaugurated by Smt.Meira Kumar, Hon’ble Union Minister for Social Justice & Empowerment on October5, 2007. The channel was named as “Navshikhar” by the Hon’ble Minister. In order to expand the programme at the national level, the Council had started a project “A Comprehensive Satellite/Internet Based National Network for Education, Training and Empowerment of the Disabled” in February 2007 in collaboration with ISRO & MLA. The project is manned by technical staff engaged on contract basis. Live programmes are telecast on different topics to over 220 institutions where the DRS facility has already been provided by the Council from Monday through Thursday. The Council in collaboration with Media Lab Asia has developed a comprehensive national web portal on disability which will be a gateway to all related information regarding differently disability issues. The promotion of web portals on the internet is one of the initiatives of National Knowledge Commission to open up knowledge sources and resources for public use. The portal is designed to provide all related information regarding different disability issues at one platform. This will enable persons with disabilities, NGOs, professionals, policy makers, students, parents, community workers and all other stakeholders to access information relating to the disability sector. The Ministry of Health & Family Welfare, Govt. of India launched the pilot phase of National Programme for Prevention & Control of Deafness in 10 States and 1 Union Territory in an effort to tackle the high incidence of deafness in the country, in view of the preventable nature of this disability. This programme included seven tiers of interactive training programmes from the state level to the village level, which provide the knowledge of ear disease and basic measures to prevent and manage common conditions and help people to use hearing aids effectively. Training of following personnel was envisaged under the programme. Training of Doctors of PHCs & CHCs. Training of Public Health Nurses, Multipurpose Workers, male and female (ANMs) Anganwadi Supervisors (AWW Supervisor) and child Development Project Officers (CDPOs). Training of Health Workers and Grassroots level Anganwadi Workers. Training of Primary School Teachers/Parents at Village level. Conduction of meetings of the project partners. Appointment of staff for State Project Implementation Team. Selection of Master Trainers and deputation of Master Trainers to the masters training programme conducted by Ministry of Health & Family Welfare. Preparation of Performa & Questionnaires to get feedback from Trainees, Resource Persons and Organizers. Method for marking of pre and post test papers for uniformity in evaluation. Review meeting with the state Implementing Agencies regarding work completed, Problems faced and future plans. The Pilot Project with total financial outlay of Rs.1.50 crores from the ministry of Health & Family Welfare was completed on 31/03/2008 and a final report submitted to the Ministry of Health & Family Welfare. 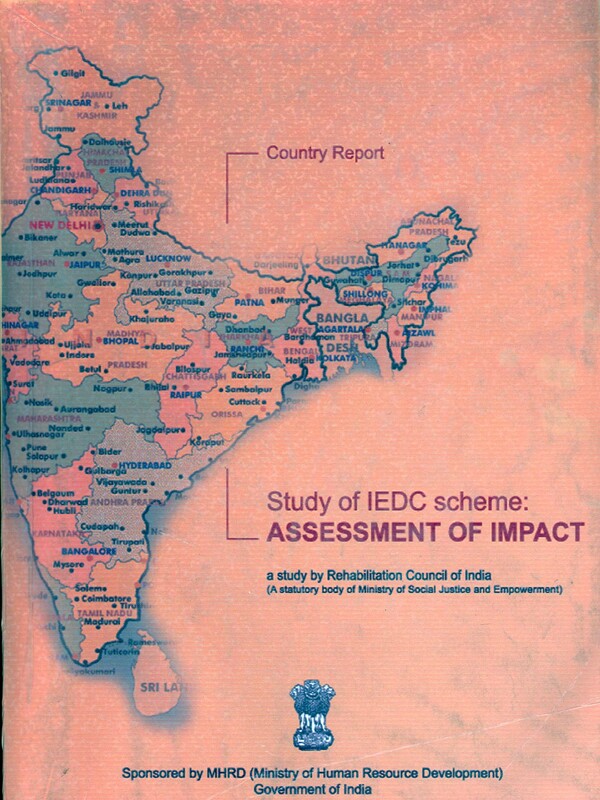 The RCI had launched a National Programme of Bridge Course from October 1998 with aim to give on time opportunity to special Teachers / Rehabilitation Workers, who had been working in the area of rehabilitation of the disabled without any formal training / recognised qualification prior to June 1993. The RCI Act 1992 was enforced by the Central Govt. from June, 1993 and thereafter every person desirous to work or started working in the field of Rehabilitation of Disabled should undergo regular training programme approved by RCI. After achieving the target of Bridge Course in 2001, the scheme was closed. Prof. P. Jeyachandran, President, Vijay Human Services, # 4, Lakshmipuram, 3rd Street Royapeetah,chennai. Prof. Beena Shah, Director (P&DD), Indira Gandhi National Open University Maidan Garhi, New Delhi –68. Mr. Ashwini Aggarwal, 8, Subham Apartments, Patparganj, Delhi – 92. It is my privilege to submit the Country Report as the project has fulfilled all its objectives. IEDC scheme assessment was a very important task which has been completed successfully by the RCI project team. The assessment study has been the dream of many people who are related with this scheme directly or indirectly across the country. Project team ultimately completed the big assignment because of direct and indirect support of a large number of professionals and experts in the field of disability. There is ample scope for the researchers to study further in detail and interpret more because we have gathered voluminous data. Research team has tried best to analyze and interpret data in limited period of time. First of all I express my utmost thanks to late Shri Lal Advam, Chairman of the core committee, who had enriched us by his unstinting support during the course of the work and also by providing important inputs at crucial times. It was a great opportunity to assess the impact of the scheme under his supervision as he had conceptualized and prepared the IEDC scheme. I want to express my sincere thanks to Shri 0. N Singh former Director, Dept. of Secondary & Higher Education, for extending his helping hands whenever it was required A plethora of thanks is due to Shri B. Anancf, Director of Integrated Education Dept. of Secondary & Higher Education and Shri S. Prabhakaran Under Secretary along with the MHRD team for their continuous support. We are thankful to the officials and educational administrators of Govt. organizations, Universities and Non-government organizations of the 18 states who have extended their helping hands towards RCI project team during the study. The state coordinators deserve special gratitude because they have performed their job perfectly. The Persons With Disabilities (Equal Opportunities, Protection of Rights and Full Participation) Act, 1995, passed by the Indian Parliament seeks, inter alia, to create a conducive environment in the country to facilitate equal participation of and giving an opportunity to the disabled to join the mainstream and contribute increasingly in the process of nation building. The act also prescribes in Chapter IV (d) to provide training to the staff in the Primary Health Centres (PHCs) to help create better service facilities in the country. The Primary Health Centre (PHCs) network in India is largely rural-based and it is the only structure within the health services delivery mechanism, which functions throughout the nook and corner of the country and has got necessary minimum infrastructure to provide various services for the people living in rural areas. Hence, the Rehabilitation Council of India (RCI) felt that sensitizing the Medical Officers working in the Primary Health Centre on some of the important aspects of disability prevention, early identification, intervention, referral and rehabilitation, valuable services could be rendered to the people of rural areas. The programme was launched throughout the country on 30th July 1999. It s being implemented in two stages. In the first stage, Master Trainers including Medical and Rehabilitation Professionals are trained and in the second, the trained Master Trainers orient the Medical Officers to disability management. The Programme is implemented in various States of the country under the direct supervision of a State Implementation Committee (SICOM) constituted under the Chairmanship of the State Health Secretary or a Designated Officer. The Secretaries/ Representatives of the Departments of Welfare and Education are also included in the Committee to give the programme wider thrust. After the SICOM is formally constituted in a State, the State's Health Department issues letters to the District Medical Officers/ Civil Surgeons to depute the Medical Officers of the Primary Health Centre to participate in the programme. An Apex Co-ordination Committee is also constituted by the RCI to co-ordinate, monitor and evaluate programme implementation at the country level. Normally, nine Medical and Rehabilitation Professionals participate in a Master Training batch and 20 Medical Officers participate in a Primary Health Centre Medical Officers' orientation batch. So far, 642 Master Trainers have been trained up to March 04. and 18,519 Primary Health Centre Medical Officers have been trained. The programme is implemented by selected government and non-government agencies. These agencies have been selected to impart training because of their distinguished experience in delivery of disability/ rehabilitation services and also on the basis of possessing suitable infrastructure, faculty, laboratory, equipment, etc. The council is in the process of extending the programme to unrepresented states soon. 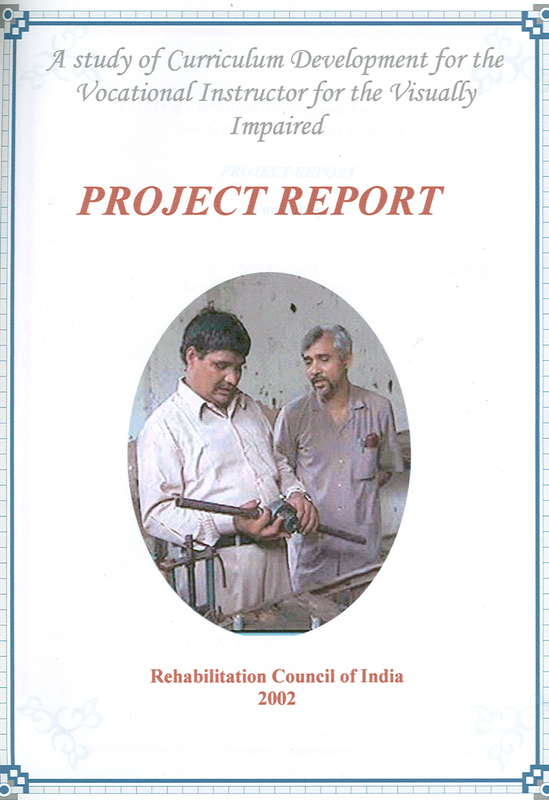 A Manual containing the prescribed curriculum by various experts on disability/ rehabilitation, an Information Booklet incorporating various relevant information like the structure, function, etc. of the RCI, concessions offered to the persons with disabilities by the Central Government, nodal agencies working in the field of disability, special employment exchanges, vocational rehabilitation centres etc., a list of organisations working in various areas of disability in different States/ Union Territories (UTs), a list of concessions offered by the concerned States/ UTs, Video Cassettes on various areas of disability have been provided by the RCI to help the training institutions provide better quality of training. The programme is expected to generate the following benefits in the short as well as in the long run. First disability programme with a curriculum covering almost all the aspects disability coupled with field experience. 26 Ayodhya Charitable Trust, Vikas Nagar, Wanowadi Village Pune-411040 Prof. Dr. S.S.